Imagine waking up one day to find yourself in shackles, robbed of your freedom and unable to contact your family and loved ones. This is exactly what happened to Solomon Northup, a black violin player on the advent of the American Civil War. 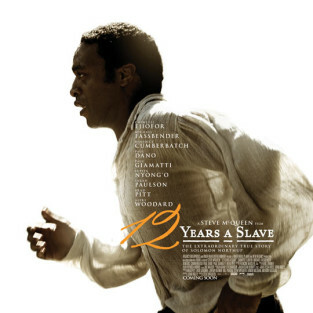 The poor man wrote a novel based on his extraordinary experiences which over a century later resulted in the multiple Academy Award winning movie 12 Years a Slave by director Steve McQueen. 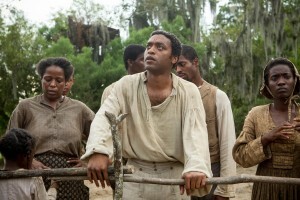 When Solomon Northup (Chiwetel Ejiofor) is invited by two distinguished gentlemen to join them on a musical tour in Washington nothing could suggest he would be separated from his wife and children for over a decade. Yet he is drugged and transported to a cell where he wakes up the next day. Mr. Ford handles a dispute with Tibeats. 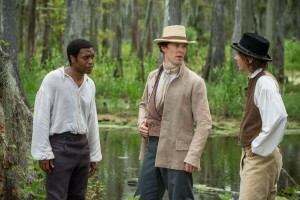 Northup receives the new name Platt and is sold as a slave to a compassionate land owner by the name of Mr. Ford (Benedict Cumberbatch). Too bad for Platt, his supervisor Tibeats (Paul Dano) shows less sympathy for his slave and even tries to hang him. A breathtaking scene in the movie shows Platt tiptoeing for nearly a minute until his rope is cut by one of the more experienced supervisors. This event gets Platt transferred to the ranch of the ruthless Mr. Epps (Michael Fassbender) where he will spend most of his slave years. His qualities as a violin player are being more appreciated than his efforts as a cotton picker which are way below average. Merciless plantation owner Epps and his slaves. On the ranch he befriends Patsey (Lupita Nyong’o) who is Mr. Epps favourite girl whenever he feels lonely, which displeases Mrs. Epps of course. When Epps lacks the guts to whip Patsey himself, he orders Platt to do it instead. This is one of the most shocking scenes in the movie as you see the blood dabble every time the lash hits her bare back. A friendly carpenter helps Platt to his freedom. A decade after his arrival, Platt meets two white workers on the farm to whom he confesses his true identity and reveals his life story. The first, a recovering drunk, tries to betray him when he is asked to deliver a letter that could help Platt’s release. The second is a righteous carpenter by the name of Bass (Brad Pitt) who promises Platt to write a letter to his friends up north, explaining his situation. This ultimately leads to Platt’s release and the slave resumes his life as Solomon Northup with his family and newborn grandson. This visually explicit and at times harsh movie was nominated for several Academy Awards and won the Oscar for best picture, best supporting actress for Nyong’o and Michael Fassbender deserved to win the Oscar for best supporting actor but Jared Leto ran away with it, dressed in drag for The Dallas Buyers Club. Hans Zimmer‘s soundtrack is fine but not inspiring enough to earn an Oscar nomination.